Sales has been around a long time. Originally a model to persuade and convince others to make a purchase, the sales model has been shifting a bit through time. First we had the serpent who convinced Eve to eat the apple, and promise not tell God. Through history we’ve had the money lenders and the shysters, the snake oil salesmen and the grifters. In modern times we’ve had Dale Carnegie – whom I consider to be the Father of modern sales – who taught us how to meet someone for coffee in order to get a good conversation going, face-t0-face. Then we had Linda Richardson who started Consultative Selling and who got us to find out about needs. The internet has given us great new capabilities and challenges – how to capture buyer data so we can get them the right data, and potentially close more sales. But let’s stop and take stock for just a moment. Are we really, really, doing anything different than we’ve been doing all along? And has the field really, really changed? Sadly, from a bird’s eye view, I don’t think so. In fact, the results remain the same as they have through time. Given all of our new ideas and capabilities, what’s going on? WHY DO WE GET THE SAME RESULTS REGARDLESS OF INDUSTRY OR EFFORT? Is it our job that’s at fault? Is a seller’s job to place solution? If that’s it, we are failing or we’d close more. Is a seller’s job to understand the buyer? If that’s it, we are failing or we’d help them manage their internal buy-in and change management issues first, before trying to sell. Is a seller’s job to ensure that we are adequately representing their company, and company’s solution? If that’s it, we are failing or more buyers would know how to choose us. I say this because our close rates of less than 10% are below a statistical average. 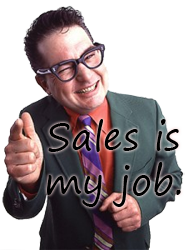 Makes no sense: Great sales folks, professionals with the best will in the world, with good skills of communication and charm, with great products, pitches and presentations, are failing. No, not because the buyer is stupid, or because products are overpriced (two excuses I hear a lot), but because in all this time, the focus of the sales model is the same: keep the seller engaged in needs analysis and solution placement. Get buyers to buy because their need matches the sellers solution. It’s been all focused on the seller – not the buyer. Because if the focus of sales were truly on the buyer, sellers would have learned some new skills long ago to help improve their averages. Because if sellers are failing more then 90% of the time, why are they being maintained, and well-compensated, and not offered additional skills? Why is the excuse that the ‘buyer is stupid’ acceptable but the sales model never questioned as being inadequate? Why do we forget the basic facts that we know about people – that people don’t take any action until there is internal agreement, and they revert to comfortable behaviors until then. As sellers we continue to have the same defenses we’ve always had. We handle objections, and get past gatekeepers, and get to VITO, and learn how to present better than our competitors. But we’ve been doing these things for decades, if not centuries. And they are all necessary because of the rejection and objections we get, rejections and objections because we are pushing our solution into something so much larger than just an area of fit. And unless folks are using Buying Facilitation™ as a front end to the sales model, they continue to get the results we’ve always gotten through history. Buyers (like all of us) live in a system of idiosyncratic people and policies, rules and relationships. Any problem that needs resolution is a part of other things (nothing exists in a vacuum) and sales treats the identified problem as if it were an isolated event. As we know – it’s a law of nature – any system will reject outside annoyances in order to maintain homeostasis, or the normal order and balance. Our buyer’s have needs. We have solutions. These days, our buyer’s systems are far more complex than they have ever been: there are more stakeholders, decision makers may be in other countries, job descriptions shift daily, solution possibilities are almost endless. And the job of understanding need and placing solution is no longer good enough: we must, must change the sales model to enable the system to bring in something new, to make the types of decisions that will enable buy-in throughout the stakeholder groups, to ensure that the buyer can maintain equilibrium once a new solution is added. The model of sales we’ve been using doesn’t do all this. And we’ve not changed our skills in all of these years. In fact, we enable the failure of under-10% close by not expecting more. What would we need to do differently if we truly cared about buyers getting the right solution? What would we be doing differently if our jobs were to help buyers know how to enable the stakeholders to create/maintain balance as they solved their problem? What would we be doing differently if our jobs were to be true consultants and advisors? We would have 40% close rates, no need for handling objections, a sales cycle that is not more than 5 months for complex sales (lower for everything else, of course), and we’d have little need for travel or large presentations. It’s now possible to add a new skill and get different results. Why aren’t we doing it?